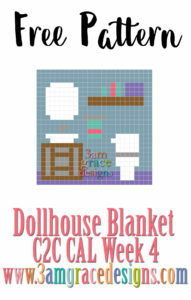 Welcome to Week 4 of our Dollhouse Blanket C2C CAL! Our fourth square is the Bathroom. Click HERE to download the Bathroom graph. Have you joined our Facebook Group! We’d love you have you! Happy Crocheting! Enjoy the rest of your weekend!